Stunning genuine antique Fred Harvey Era (aka railroad jewellery) large green turquoise thunderbird sterling silver ring. The thunderbird design on the shank depicts the sacred bearer of happiness unlimited in Navajo traditions. 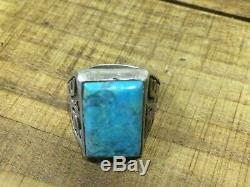 Completely unisex ring size UK P 1/2 With the turquoise centre stone measuring 2cm x 1.5cm. A genuine piece of history and utterly stunning. 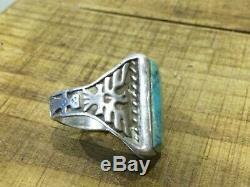 The item "Antique Sterling Silver Rare Fred Harvey Thunderbird Navajo Turquoise Ring P 1/2" is in sale since Friday, March 8, 2019. 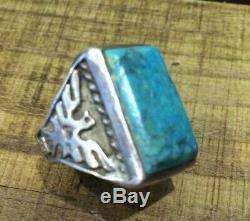 This item is in the category "Jewellery & Watches\Ethnic & Tribal Jewellery\Native American". The seller is "gh05tsquad" and is located in Winkleigh. This item can be shipped worldwide.